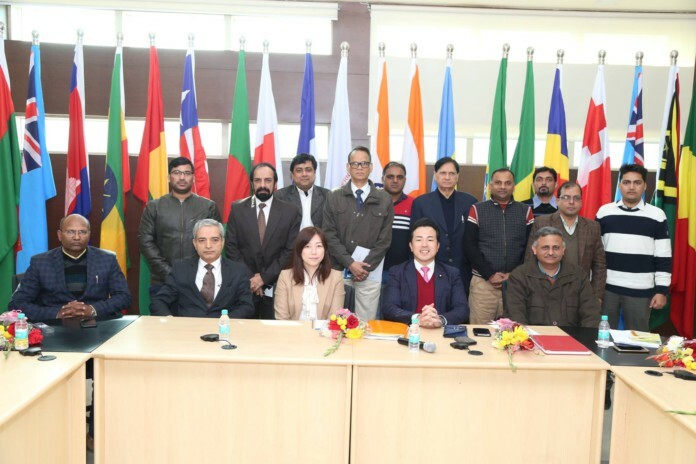 International Solar Alliance office in India visited by Japanese Vice Minister Foreign Affairs. He shared views on the Solar generation and its future in India and beyond during the meeting. Mr. Takashi Uto, Hon’ble Vice Minister Foreign Affairs, Government of Japan, also Chairman, Committee on Foreign Affairs and Defense Government of Japan along with his wife Mrs. Tomoko Uto visited ISA headquarters and NISE facilities on 7th January 2018 at Gurugram. Mr. Uto a retired Captain from the Japanese Air Self-Defense Force is a second time House of Councillor elects. He showed a keen interest in ISA, its mandate, and activities. He also informed about Japan’s new found faith in solar energy, especially after the Fukushima nuclear disaster. Hon’ble Minister also assured Japan soon becoming an ISA member country. The ISA (International Solar Alliance), an initiative of 121 prospective Member Nations situated between the Tropics of Cancer and Capricorn, is accelerating development and deployment of solar energy in these countries through inter-governmental cooperation, trade networks, investor connect and technology exchange. Next articleStrategic Partnership Between American bike company Detroit Bikes and Israeli SoftWheel Ltd.